The last few days many people have been talking about the USC’s contour printer. 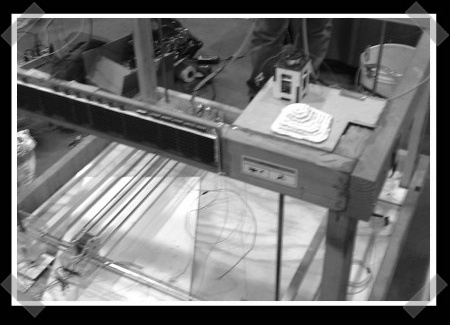 It’s a device that prints concrete outlines with the hopes of eventually printing entire houses. Caterpillar has decided to back the initiative. As our final Maker Faire post, we thought we’d talk about some of the curious items that were handed us during the event. While checking out Evil Mad Scientist Laboratories‘ latest generation CandyFab were given their AVR business card breakout board. [Garrett] gave us a handful of ShiftBrites to play with in a future project. We donated to the EFF, as we’re wont to do, and received a super bright blue flashlight for spotting the yellow tracking dots on color laser printouts. If you’re not familiar with this topic, you should check out bunnie’s blue light scanner. Our final stop was at ifixit to pick up a free set of spatulas (spudgers?) for popping open iPods. All around a decent haul. 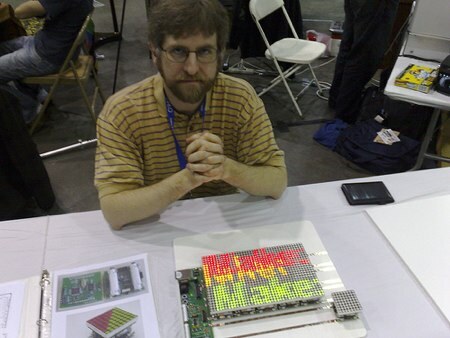 [John Peterson] showed us his Puzzlemation, animated tile puzzle at Maker Faire. It was originally designed for the Microchip 16-bit Embedded Control Design Contest. The puzzle is made from multiple modules each with an 8×8 LED grid. The tiles are battery powered and each one has PIC24FJ64GA004 microcontroller. They sit on a tray with flat copper strips as a serial bus. The tray controller broadcasts the animation to the tiles. Each tile waits for its unique identifier and saves that portion of the animation. The tiles don’t actually know what order they’re in so once the animation is in motion you can figure out their proper order; rearranging them so the animation is correct. We’ve got a video of it in action after the break. We made a point to stop by [garrett]’s booth at Maker Faire to to see what he had been working on. You may remember him from his random caps locker shenanigans. He’s just recently released the ShiftBright RGB LED module which makes it easy to implement a string of individually addressable LEDs. The module is based on the Allegro A6281 3-Channel Constant Current LED Driver. The driver chip is capable of displaying a billion colors using an RGB LED. The 3x3mm package is mounted to the backside of the board while a bright common-anode RGB is mounted to the front. The modules are designed to be daisy chained together and are individually addressed using a serial interface. You can find Arduino example code on the site and more info on how the item was developed. Read on for close up images. [Romado12187] just posted a walkthrough of his mechanical dry erase board project on Instructables. 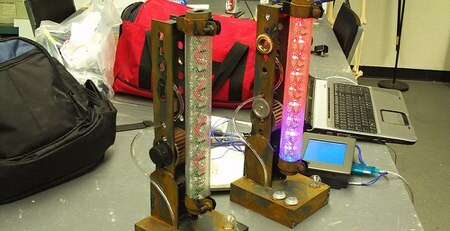 It was on display in the Microsoft booth last weekend at Maker Faire. Unlike [sprite_tm]’s version we covered earlier, this one is built more like a traditional pin plotter. The construction was done entirely in [Romado12187]’s dorm room and uses plywood and PVC pipes for the majority of the frame. The mechanical components were purchased from SDP/SI and the controller hardware are Phidgets. He included a joystick, but it also has a C# command line program for control. [Romado12187]’s write up also has a lot of improvements to help make your first attempt better than his; buying a premounted board and being very exact in calculating motor power are recommended. Catch a video of the plotter in action after the jump.